Abstract: Optomechanical systems offer one of the most sensitive methods for detecting mechanical motion using shifts in the optical resonance frequency of the optomechanical resonator. Presently, these systems are used for measuring mechanical thermal noise displacement or mechanical motion actuated by optical forces. Meanwhile, electrostatic capacitive actuation and detection is the main transduction scheme used in RF MEMS resonators. The use of electrostatics is convenient as it allows direct integration with electronics used for processing the RF signals. In this talk, I will introduce a method for actuating an optomechanical resonator using electrostatic forces and sensing of mechanical motion by using the optical intensity modulation at the output of an optomechanical resonator, integrated into a monolithic system fabricated on a silicon-on-insulator (SOI) platform. I will discuss new applications enabled by this hybrid system including multi-GHz Acousto-Optic Modulators (AOM), Opto-Acoustic Oscillators and Opto-Mechanical Inertial Sensors. Biography: Sunil Bhave received the B.S. and Ph.D. degrees from Berkeley in EECS in 1998 and 2004 respectively. In October 2004, he joined the faculty of Cornell, where he is presently an Associate Professor in Electrical Engineering. 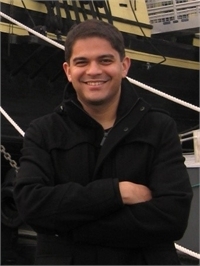 Sunil received the NSF CAREER Award in 2007 and the DARPA Young Faculty Award in 2008. His students have received Best Paper Awards at IEEE Photonics 2012, Ultrasonics 2009 and IEDM 2007. Sunil is a co-founder of Silicon Clocks, which was acquired by Silicon Labs in April 2010. He recently returned to Cornell after an industry leave working with the MEMS Inertial Sensors team at Analog Devices.